A new BRA, but at what cost? Since 2010, members of Connolly’s City Council staff have appeared before the BRA 23 times to speak in favor of projects under review. In the three years before he hit the campaign trail, Walsh (right) appeared before the BRA board 42 times to offer support for various building projects. 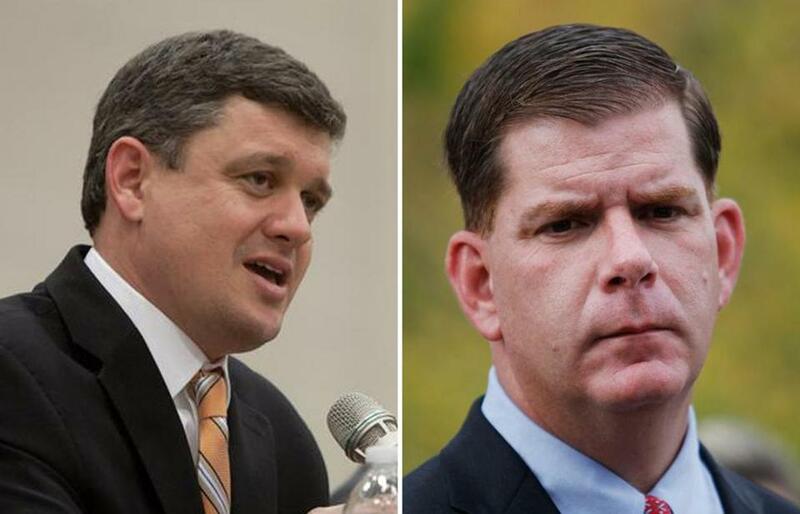 Boston mayoral candidates John R. Connolly and Martin J. Walsh have sharply criticized the Boston Redevelopment Authority during the campaign, saying it must be reformed or dismantled to make development more accountable to residents and businesses. But no matter who takes office in January, it will be difficult and time-consuming to turn the tough talk into action . Some say it may also be unwise to make radical changes in the midst of what has become a historic surge in development. Gleaming office towers and large residential developments are under construction from downtown to East Boston to Dudley Square, and every one of those projects needed BRA approval. But critics often accuse the enormously powerful authority of operating behind closed doors and ignoring outside voices. Connolly and Walsh have said the BRA must be overhauled to make it more transparent, and that they know how to do it. In the years before the campaign, they both frequently appeared before the BRA board to support a wide array of major development projects that promised jobs, neighborhood improvements, and economic growth. Fiscal watchdogs and others say a major restructuring of the authority could halt such activity, depriving the city of tens of millions of dollars in annual tax revenue to pay for things like schools, public safety programs, and transportation improvements. Because the BRA was created under state law, major changes would require approval from the Legislature, which could take months, or longer. Four of the five BRA board members are appointed by the mayor and confirmed by the City Council. The governor appoints one. Both candidates promise they would not back changes that would interfere with development activity. Walsh said he intends to create a task force to recommend reforms, but continue to entertain building proposals while those changes are pending. The BRA has been in charge of reviewing all major development projects in Boston since 1957. In recent decades, it has overseen a vast transformation of the city during which countless commercial and residential buildings have been added. But some residents and businesses have objected to its decisions and to a process that often appears closed to ordinary citizens. Walsh has proposed the most sweeping changes to the authority. He has outlined a plan to replace it with a new agency with separate divisions for planning and development. He has also proposed term limits for the new agency’s board members and said he would give more oversight of its finances and operations to the City Council. In the three years before he hit the campaign trail, Walsh appeared before the BRA board 42 times to offer support for building projects, from Brighton to the Fenway to the South Boston Innovation District. During that time, he never opposed a project or mentioned concerns about transparency. Walsh spokeswoman Kate Norton said the candidate had commented before the board in his former capacity as president of the Boston Building Trades Council, a labor union whose members rely on jobs created by development projects. Connolly has also been a strong supporter of projects that were before the board in recent years. Since 2010, members of his City Council staff have appeared before the BRA 23 times to speak in favor of projects that were under review. He has proposed to separate its planning and development functions and institute terms limits for board members. But he is not pushing to dismantle or abolish the agency. “I’m not sure that reinventing the wheel is where we should go,” Connolly said, adding that he would convene a group including residents, businesses, developers, and others to consider options for improving the BRA. Representatives of the real estate industry say talk of overhauling the BRA has already unnerved developers. Many have filed plans in recent months to try to lock down approvals ahead of the election. Mayor Thomas M. Menino said recently that two financial companies told him they were holding back on real estate deals after candidates vying to succeed him had promised major changes in the authority. Larry DiCara, a lawyer who represents developers in Boston, said many of his clients are concerned about investing in the city at a time when candidates are talking about overhauling the review process. “The greatest fear my clients have is that the system will change so dramatically that they have absolutely no idea whether it’s worth the investment of time and money to even try,” DiCara said. Tyler, the Boston Municipal Research Bureau president, said that while he understands the campaign trail criticism by the candidates, it will be difficult for them to follow through with major changes if it results in a significant disruption in development. Tyler noted, for example, that construction generated $197 million in additional tax revenue for the city between fiscal years 2008 and 2013. Such growth is one of the only means of offsetting decreases in state financial assistance and other cuts that have put the city in a financial vise. In the current fiscal year, Boston faces a projected budget shortfall of about $30 million.